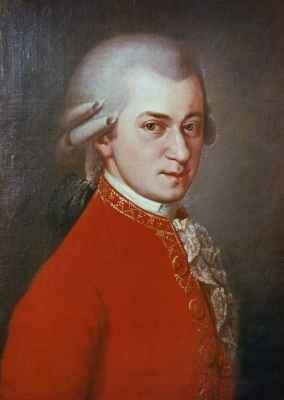 Wolfgang Amadeus Mozart was born on January 27, 1756 in Salzburg, Austria. Mozart's father Leopold, was a well respected musician in Austria. Leopold taught his son about music at a very young age. By the time Mozart was 14, he had already written many sonatas. In 1782 Mozart married Constanze Weber, a professional singer. Mozart became very famous during his childhood and people throughout Europe wanted to hear him play his original music. He also composed 41 symphonies. Mozart also composed music to be performed in Churches. He wrote 19 masses and shorter works called motets. His best known Church piece is called Requiem which he wrote in his last year. 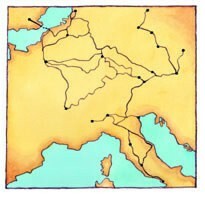 The map above traces Mozart's famous travels. Vienna, which you can find to the right of the map, actually lies in the heart of Europe, on the banks of the great river Danube. The city was a natural centre for the distribution of goods of all kinds throughout Europe. Mozart wrote his most famous symphony, Symphony No. 41 in 1788. Symphony No. 41 was given the name "Jupiter" because it was connected to the roman gods. Jupiter is the roman name for "Zeus" the king of the Greek gods. Another way to put it is Symphony No. 41 is the absolute best of all of Mozart's symphonies. Because of his constant travels Mozart eventually learned to speak fifteen languages! Mozart's full name was Johannes Chrysostomus Wolfgangus Theophilus Mozart. His family called him Wolfi. Legend has it that when Mozart was two years old, he recognized a pig's as a G sharp! It would take over 8 days to play all of Mozart's music, one piece after the other one, without stopping. Children's Digest. Oct./Nov. 1999: 28-31. SIRS Discoverer. Web. 22 Sep. 2015. Cherlin, Deborah. "Wolfgang Amadeus Mozart (1756-1791). "SIRS Discoverer. Fall 1996: n.p. SIRS Discoverer. Web. 28 Sep.2015.